*I am an affiliate PAWtner with PrideBites™. If you make a purchase through the links in this post or with my discount code, I will receive a small commission. It won't cost you any extra BUT you'll save 20%. 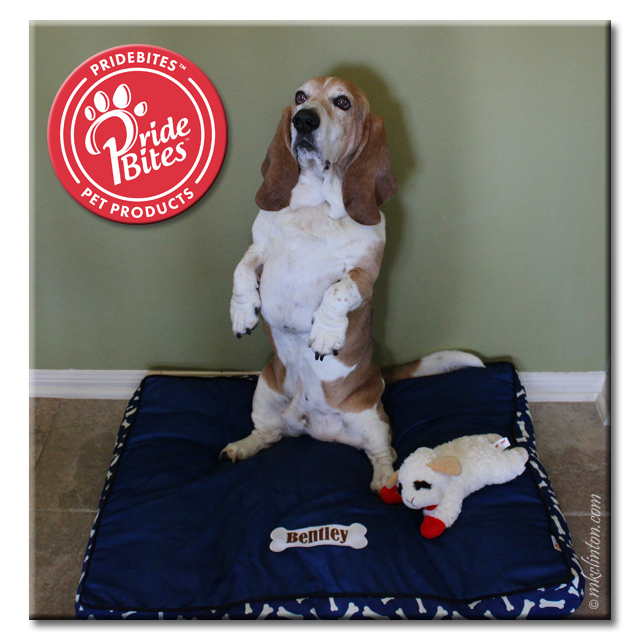 “Hello, it’s Bentley Basset Hound and I am super psyched to tell you about my new bed from PrideBites™. It was one of the first things since we moved that was officially mine...all mine. If you have brothers or sisters, you are probably used to having them use your things without asking. Pierre is always trying to steal my beds, play with my toys, and even share my treats. I’m a good sport about most of those things but I draw the line at my PrideBites Stormy Paws Canvas Bed! Usually when I catch Pierre with my things he always says, “I don’t see your name on it!” That is not a problem with my new bed. You see, it has my name written in PrideBites’ Big Dog font. I love the denim color and the cool bones design on the sides. The thick charcoal-colored accent piping helps the bed keep its shape. It is machine washable so if I happen to drool in my sleep, clean-up is easy. The plush poly/cotton stuffing is removable, but your Mom will probably not put it on the floor for you to sleep on while your bed cover is washing. I speak from experience on that one! She will also want to snuggle with you while you are trying to snooze. It's because the bed is just that inviting. Beds are only good if they are comfortable and easy to catch a few zzz’s or a good night’s sleep. I’m happy to say the Stormy Paws bed checks all the boxes. I can curl up like a cinnamon roll or stretch out like a lion and have plenty of room to spare. This is the medium size which is 34”x26” and 4” thick. The bottom has a non-skid surface so I don't have to worry about scooting across the floor if I chase rabbits in my dreams. It’s the perfect size for me. Pierre is sure there is room for him too but I have to take a stand. Sorry little buddy, this bed has MY name on it! 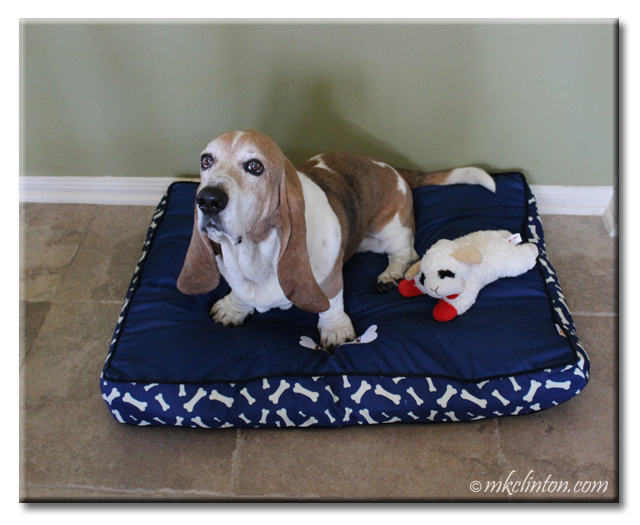 You will love a canvas bed like mine but you could decide to customize and personalize the PrideBites Lounger or Fleece bed. Our next order will be for one of their new crate pads for the car kennel. We deserve to travel in style and comfort too. 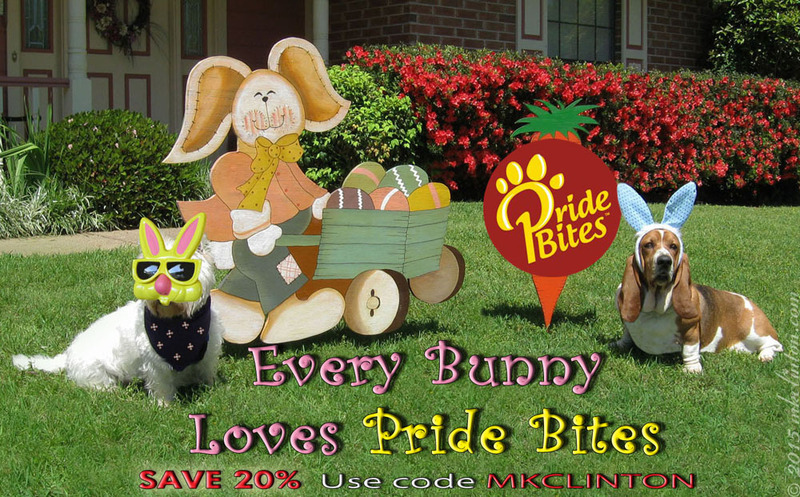 Besides, Mom has so much fun designing PrideBites products that it is easy to convince her we always need something new! Subscribe to Barking from the Bayou and we will be in your email each weekday so you can enjoy us with your morning coffee! 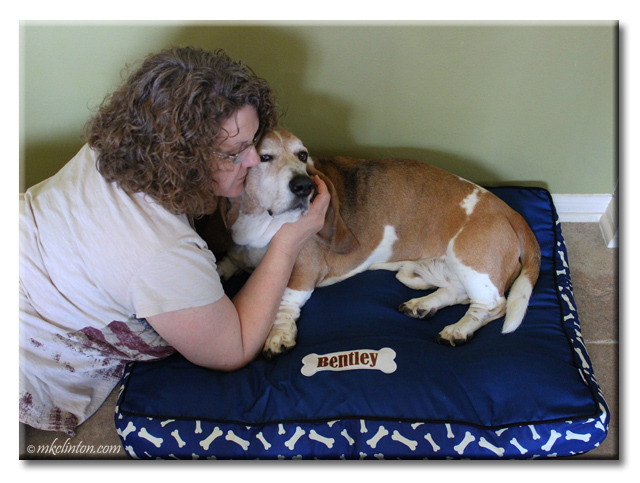 Your new bed is beautiful, Bentley - and we love the pic of your mom giving you sweet caresses! Thank you! She love to give me kisses when I am trying to relax. BOL! New house and new furniture for the peeps and the pups, good deal! I like a bed with sides so I can really snuggle, but yours looks very manly! It was designed with my macho-ness in mind! Bahahaha! I am seriously considering labeling my treats next! Mama said I was talking in my sleep last night. Luckily, she didn't understand what I was saying. BOL! That is a nice bed. Thank you. It is very comfy! We are loving all of our new things and Pierre is going to review a PrideBites towels wit his name AND photo on it! LOL! Thanks! Mom loves the way she could select each part of the bed. It turned out really cute. We love PrideBites. Your bed is a beauty! I have a PrideBites blanket with my picture on it. Thank you, Cupcake! We have PrideBites blankets too and they are very snuggly! What a comfy bed! We would even sleep on it...even if it has dog bones. You could totally order one with flowers of a solid color and all sleep on it! Looks like a great bed and even better to have your name on it! I have had to point out my name to Pierre 87 times! He always tries to catch a quick nap on it when I'm not looking. Ad I are a bed thief too! Maybe it are somefin bout being a westie. Pierre steal my bed and then hogs Mom's side of THEIR bed at night! It is definitely a Westie thing. What an adorable bed, I love that it's personalized with your name on it Bentley. Sweet dreams! Thanks, Cathy! We love that it is so easy to personalize our PrideBites products. Wait until you see Pierre's towel review. It's coming up soon! that is a super bed!!! and I hope you will have the sweetest dreams there!!! That sure looks & sounds like a pawsome bed Bentley. Definitely checks off all the necessary boxes for a handsome adorable pup like you, Bentley.